Thursday morning started out with coffee, banana bread, Bill Verplank and his conte crayon. A pretty good start to the day in my world. Bill started out with three questions that every interaction designer has to answer: How do you do? How do you feel? How do you know? Within this he also discussed the difference between hot media, which is set without much room for interpretation, and cool media, which is much more open like jazz and cartoons, as well as how this plays into the matching of mediums and messages. The message needs to match the medium in which it is presented aka the medium is the message. Another area that he covered was the difference between a path and a map. 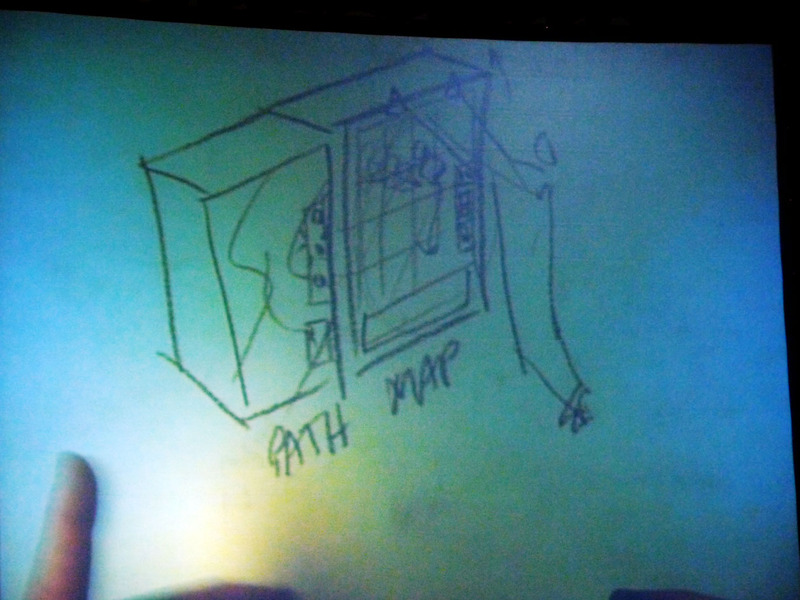 A path is more direct, but a map is more engaging and thought provoking. The example he used was of the closed vs. open vending machines. The closed vending machine offers a few options, choose and go. It is a path. The open vending machine lays out all of your options where you can see them and choose that way. It is a map. The last section of his talk had to do with mentalities and interfaces. According to Piaget & Bruner, there are three different mentalities or forms of knowledge. The first we are born with, which is motor/kinesthetic/enactive knowledge or ‘do’ thinking. At about the age of 5 we develop ‘see’ thinking where the image is what matters. Then, as an adult, we develop symbolic or ‘know’ thinking. According to Bruner we suppress each type of thought as we develop the next. 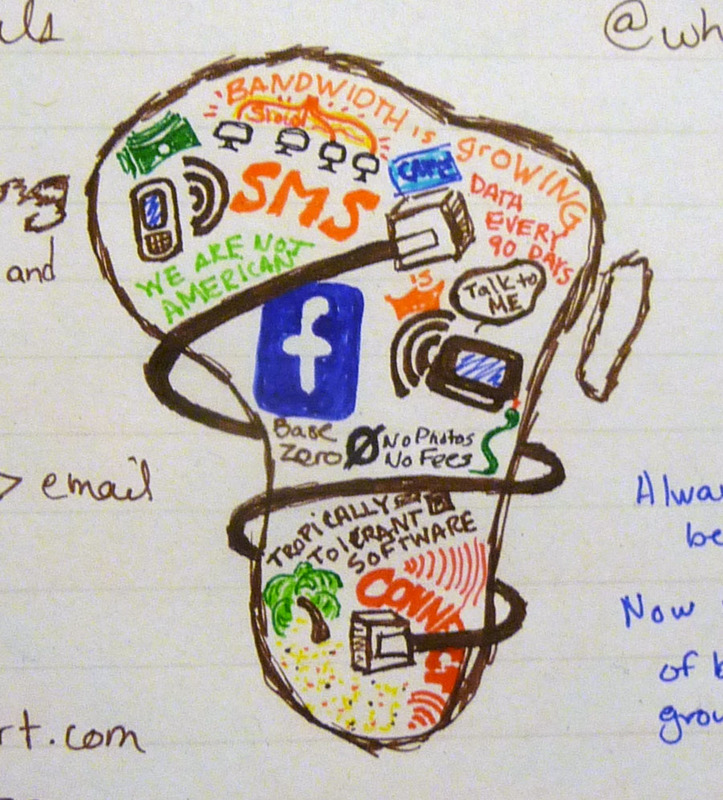 This ties into interaction and computing with the manner in which interfaces developed. The first computers were teletype computer which were all about symbols thusly ‘know’ thinking. From there we moved on to ‘see’ thinking with the birth of the GUI (Graphic User Interface) and interactive design. So what next? If we continue in this progression we will be moving to ‘do’ thinking and have already started to see the entry of tangible user interfaces. Obviously this has just been and overview, but my understanding is that the talks will be made live eventually if you’d like to learn more on this or any of the other speakers’ talks. What gives designers the confidence to say they can create something never before credited? What gives those they’re talking to confidence to believe them? To address this Michael Meyer spoke on the 3 Design Imperatives. The first is empathy as we designers must develop and show for our tools. The second imperative is core, which is the essential material available to craft the products, services, etc. The last imperative is proxy or the things that represent the sum of you knowledge and communicate understanding and ability. 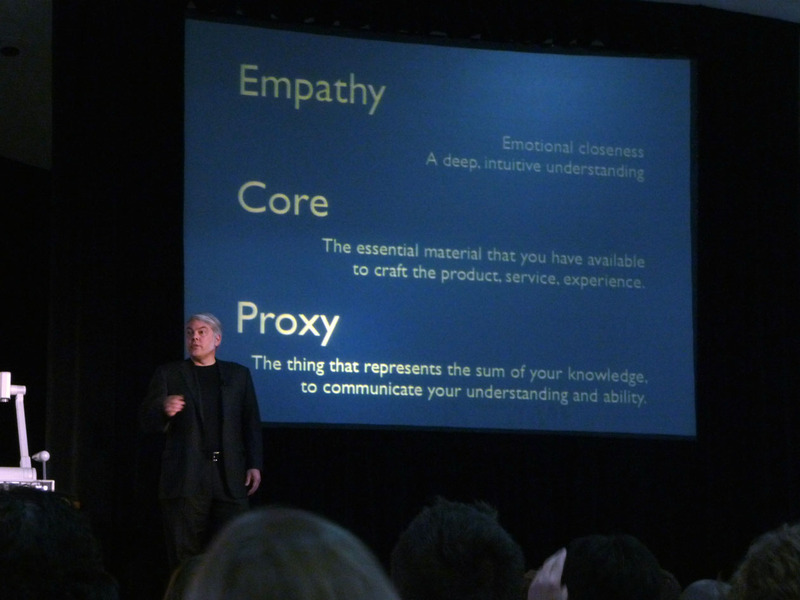 It is the combination of these three things – empathy, core & proxy – which answer the questions that began the talk in the first place for it’s those that determine the final arbitrators in design decisions. 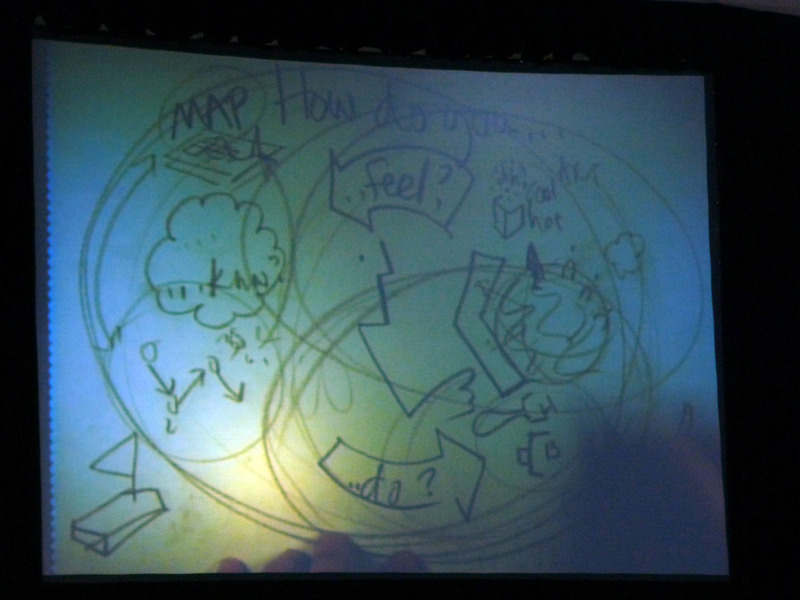 Carl Alviani brought to a point a recurring theme of the morning – how do we define ourselves as interaction designers? As probably comes as no surprise to anyone who has asked before, our field doesn’t have a really good answer to that question. As Carl pointed out, internal stories do not equal external stories and the importance of a right story is that it turns skeptics into evangelists. He gave several definitions that people have of the field with my favorite being that it’s magic. Not that this lack of understanding is a good thing, but I appreciated the comment anyway. 2. 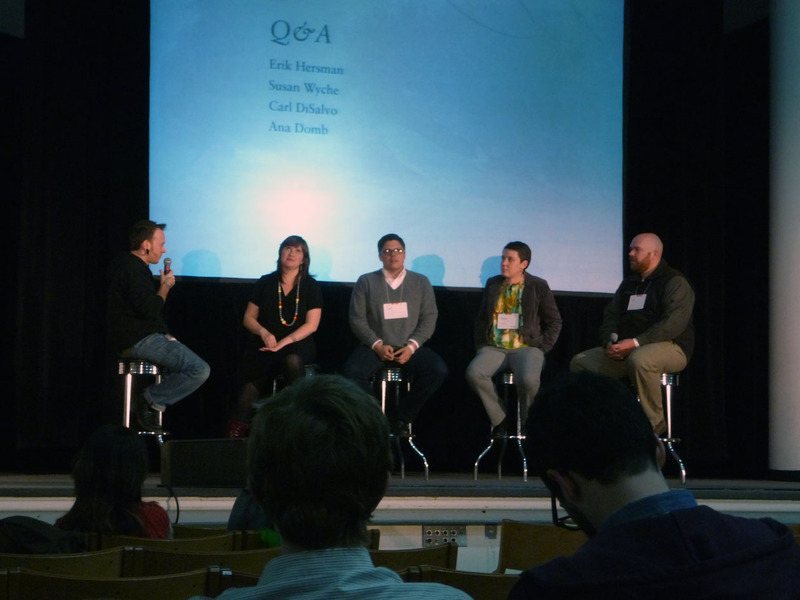 Tell an IxD at work story – w/ pics! Peter Knoche came next reminding us that there is more to life than just consuming and, in fact, that consumption has never won an Emmy or written the Great American Novel. With that he encouraged us to seek balance in our lives between the curation, creation and consumption that fill them and not only that, but to help our users find balance in theirs as well with the reminder that free cultures get what they celebrate. 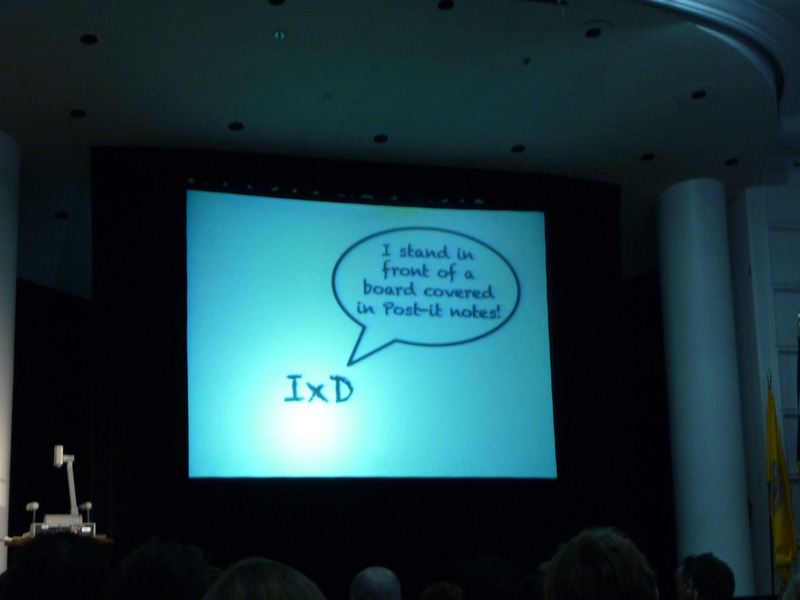 Tim Wood started out his lightning talk with quite the scandalous slide – Usability is overrated! This was followed up with the question of whether usability really is overrated when it’s just one of many factors which drive us. He ruffled a good many feathers in the twitto-sphere challenging the traditions, conventions and the continuing applicableness of these things. He asked us to truly consider before using these things for convenience and look beyond the model details to define the underlying structure and logic so that we understand the abstraction of the behavior. Erik Hersman kicked off the afternoon by sharing with us how technology is impacting Africa and the differences between there and other parts of the world. One of the largest differences is that mobile rules. While we take for granted in many places that that people will have email addresses this is simply not true of Africa. Instead the phone number trumps the email address and so the technological culture there has adapted to this. The power of the phone number does not, however, mean that people are loading their phones full of data and minutes each month. Instead they are only loading them just often enough to keep the number active. This has led to site like facebook allowing access to certain portions of their site at no cost to the user. The biggest thing that can be seen is how this is making a shift from societies that have always been top down in their structure to working on building from the ground up. He also cited a number of African sites/developers/organizations of interest including MXit, iYam.mobi, AfricanDigitalArt.com, Stonewall.co.za, NairoBits and Ushahidi. Obviously this is just a very brief overview of his talk. You can find his thoughts after speaking here at his blog. Susan Wyche followed up on Erik’s experiences with her own much shorter exploration of the internet and Africa from when she did a short term study of how Africans who theoretically could afford to get internet in their homes interact with it. What I find interesting is that those she spoke with chose not to add the expense of internet. To them the possible benefit did not outweigh the cost and they did not wish to have their lives consumed with this tool (as we Americans do). Instead they plan deliberate interactions with the internet using offline preparation to maximize their time online in the office or at internet cafes. The next speaker, Carl DiSalvo of the Georgia Institute of Technology, switched stateside as he talked about working collaboratively with small farmers on building and designing robots that would benefit them in their work. Bringing back the earlier topic of empathy, he spoke about cultural imaginaries and moving towards co-design and with that greater empathy for those we are working with. He also talked about public design. That is the construction of publics, especially with the thought in mind of bringing together all kinds of people to interact and engage with each other. It wasn’t a session I had initially thought I would find interesting, but working with the Mainstreet program I could see a lot of application for my area if not as much my paid job. The last session ended up being a favorite of mine. Ana Domb brought us an inside look at the techno brega phenomena from Brazil. It is an interesting study in how a community took a system that was not working for them (i.e. the licensed music system) and through collaborative innovation developed a new system that used both social and physical currency supporting both the artists and the audience. Because it is a true collaboration there is not bottom up because there is not bottom. The relationship is lateral so that instead of the audience being at the receiving end of the network it’s a node in the greater network. What is the role of designer in these environments? Guide & translator, yet without trying to force our own cultural perceptions upon a place and people who are different from us. Balance expertise with crushing your own ego. Work with the culture not against it and, most of all, listen. We closed out the evening with a bash hosted by Effective UI & Adobe at the Boulder Theatre which featured the wonderful taste creations of a top chef (the brussel sprouts were amazing) and two bands. I’ll close out this post with a video of Itchy-O.